There’s a reason HG Data is quickly becoming the de facto standard for installed-technologies intelligence. HG Data gives its clients more reliable data on more vendors, in more company locations and in more countries than any other. And those numbers continue to grow in every dimension. Today, HG Data reports that 2014 was a record year for growth. The biggest single factor for that growth has been the company’s global expansion. HG Data went from datasets for 1 country (United States) to 14 countries (US, Canada and 12 APAC countries). Technology vendors tracked by 70 percent—from 1,167 to 1,973. Specific technology categories tracked by 50 percent—from 3,001 to 4,598.
Business locations with technologies followed by 105 percent—from 646,740 to 1,332,129. Verified technology installs by 144 percent—from 3,111,535 to 7,613,536. HG Data maintains billions of documents in a proprietary repository comprised of active Internet, historic web and offline source files. “The multidimensional growth of our data is a great testimony to the huge value of our algorithmic and 21st-century data science approach to building our datasets,” adds Godley. It’s years’ worth of algorithms, natural-language processing, supervised machine learning, language translation, OCR and proprietary ontologies that enable HG Data to make sense out of a tsunami of unstructured data. The growth of HG Data’s dataset was matched by record client acquisition and retention. HG Data closed 2014 with 30% of F500 technology companies as customers, zero churn of its enterprise clients, tripled its partner program and revenue growth that mirrors the expansion of its datasets. Whether it be dataset growth, client satisfaction or industry recognition such as being selected as a Gartner Cool Vendor to Watch, 2014 underscored HG Data’s emergence as the must-have technology for global software and hardware manufacturers. 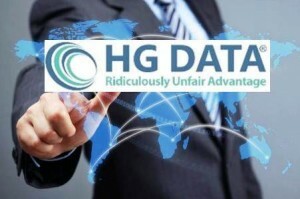 To view the categories, vendors and products HG Data is tracking click here. About: HG Data is the global leader in competitive intelligence for installed technologies. Thanks to HG Data’s machine- and natural-language processing curation methodology, the world’s largest technology companies, the fastest-growing start-ups, and some of the most innovative OEM partners gain ridiculously unfair marketing and sales advantage. Every day, HG Data indexes more than one billion unstructured documents across the open Internet, the archived Web and offline resources to produce a detailed, accurate—and growing—census of B2B technology installations in use at companies globally. Indexed resources include content such as social media, case studies, press releases, blog postings, government documents, content libraries, technical support forums, website source code, and job postings. Founded in 2010, the company is based in Santa Barbara.